I was looking forward to a nice long run today with my running buddy. When I woke up, I could already hear the wind blowing from my bedroom. My thought, living in a windy area, is to just run through the wind. If I always waited for ideal weather, I would never run (outdoors at least, which is my preferred method). So, I was going to just continue with my plans for a 7-miler today. 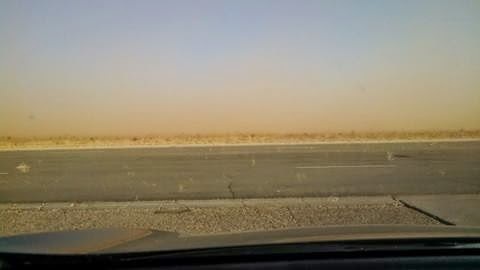 The problem, however, was in the wind details: wind advisory, high winds, blowing dust. If the wind is blowing at 10-15mph, that is a normal day. If the wind is over 20mph, I'm very hesitant to step foot outside, but I still will.. When dust is forecasted to accompany the wind, I will not step outside. When that dust is accompanying 30+ mph winds, I will lock myself in my home until it dissipates. In light of that information, here is the forecast. The dust was horrible yesterday. I didn't go outside at all! It really was awful! Although, I did give in and ended up running outside yesterday. The dust wasn't bad on base at the track, so I ended up doing track intervals--which were five times more difficult in the winds! I'm considering counting that run as double mileage hill repeats. The environment around us has some major elements and weather is one of that. Weather's effects are uncontrolled but there're ways to save ourselves. instrument to measure wind speed and temperature helps a lot in that.